The Nebraska Men's Basketball program is housed in Pinnacle Bank Arena in the recently added "Railyard" portion of the Haymarket. With a capacity of over 15,000 (1,500 of which make up the Red Zone), "The Vault" has quickly become one of the most difficult venues in the country to play in. Some games, it seems like Nebraska fans will do almost anything to "Protect The Vault". HUSKER POWER during the opposing team's player introductions, the student sections begin a HUSKER POWER chant back and forth, sometimes reaching up to 105 decibels in volume. Free Throws: During Husker free throws, students raise one fist into the air in a silent salute, followed by a "GO BIG RED, WOOOOOOoooo" when a free throw is made. 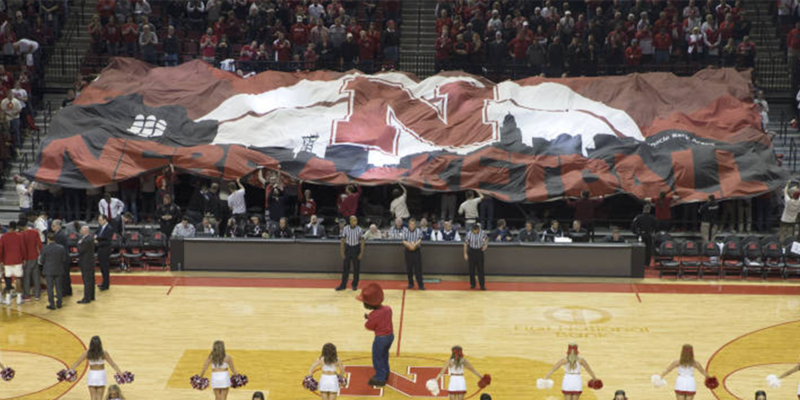 3-Pointers: When the Huskers make a three point shot, students raise the "OK" hand signal into the air and shout "THREE. POINTS. GO BIG RED".